The $3.5-billion Baha Mar mega resort has bidded out more than $400-million worth of work to Bahamian contractors, its senior vice president of administration and external relations told the press Monday. Twenty-two months into the project, the developers have awarded $232 million in contracts to Bahamian companies, Sands told the media May 6. In a nod to the level of Bahamian participation in the Chinese-backed project, another $140-million worth of contracts are currently under review and being negotiated with local companies, he added. A further $45 million have not been awarded to Bahamian contractors. Once completed in December 2014, the resort will feature some of the world’s most famous luxury hotel brands, including Rosewood Hotels and Resorts, Mondrian, which is a Morgans Hotel Group property, and Grand Hyatt Hotels and Resorts, as well as the new Baha Mar Casino and Hotel, offering a total of more than 2,200 new rooms. A total of 307 private freehold residences are available for sale and located within each of the hotels. Baha Mar will also include a new 100,000 sq ft casino–the largest in the Caribbean–and one of the most advanced and versatile convention facilities in The Bahamas measuring 200,000 sq ft. The space can double as an entertainment and sports venue. Other amenities include an 18-hole Jack Nicklaus Signature Golf Course, 50,000 sq ft of retail and entertainment experiences combining chef-branded restaurants, nightclubs and varied entertainment offerings. Baha Mar is expected to employ 8,000 directly and another 4,000 indirectly. 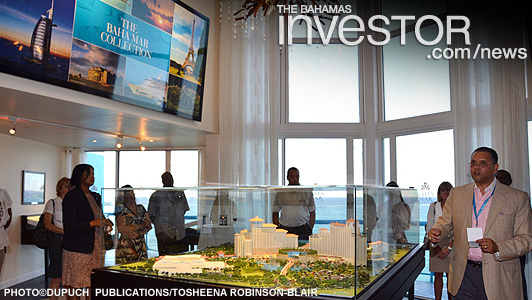 To date, Baha Mar has generated some 1,900 jobs for Bahamians, according to Sands. Prior to breaking ground in 2011, developers had said they would require works permits for up to 8,000 foreigners, mostly Chinese workers, at the project’s peak. To finance construction, Baha Mar obtained a $2.5-billion concessionary loan from China Export and Import Bank (EXIM), in addition to a $150 million investment from China State Construction America Inc, the project’s general contractor. At the press conference, Sands said the company has 1,700 work permits currently issued, trending much lower than the estimated 4,000 Baha Mar expected at this point in the project’s development. Minister of Foreign Affairs and Immigration Fred Mitchell and other relevant government officials recently held a meeting with the heads of private sector organizations to discuss immigration and work permit issues. An 'info graphic' released by The Cruise Web explores the features on the brand new Norwegian Breakaway, a 4,000 passenger cruise ship that makes her debut May 2013.